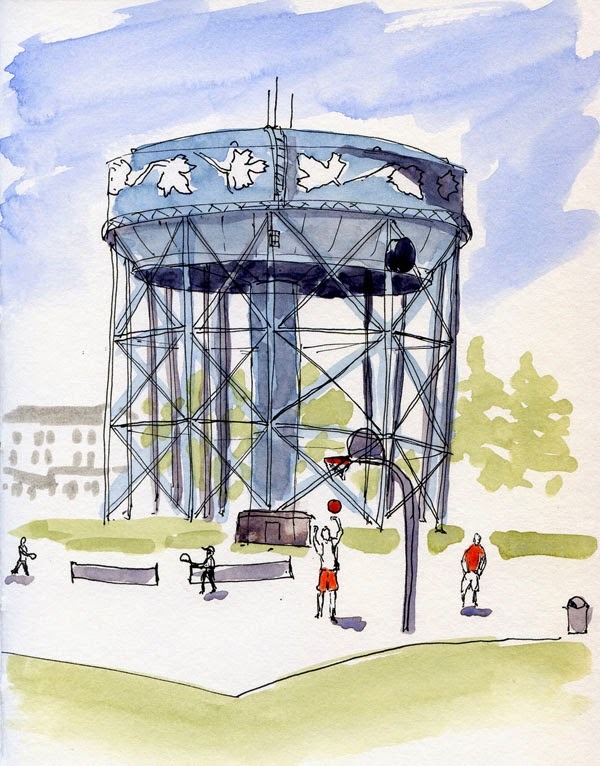 Two months ago when I sketched the Maple Leaf water tower from our new neighborhood park, the sky was sunny and cloudless, but you can see from the photo on that blog post that I was still wearing Polartec. Today the sky was again sunny and cloudless, but this time I was as happy as an urban-sketching clam to be comfortable in a sleeveless top. And it’s not even June! 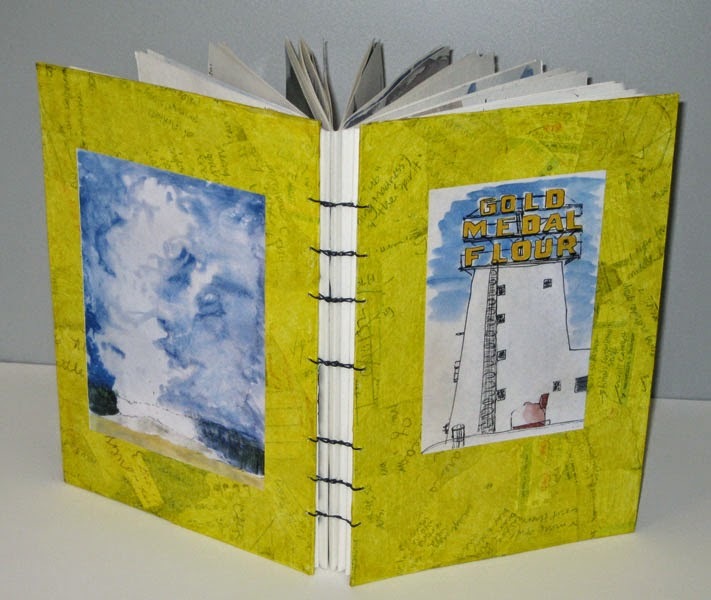 My latest sketchbook with sketches dated from April 15 through May 20 is now bound and complete. 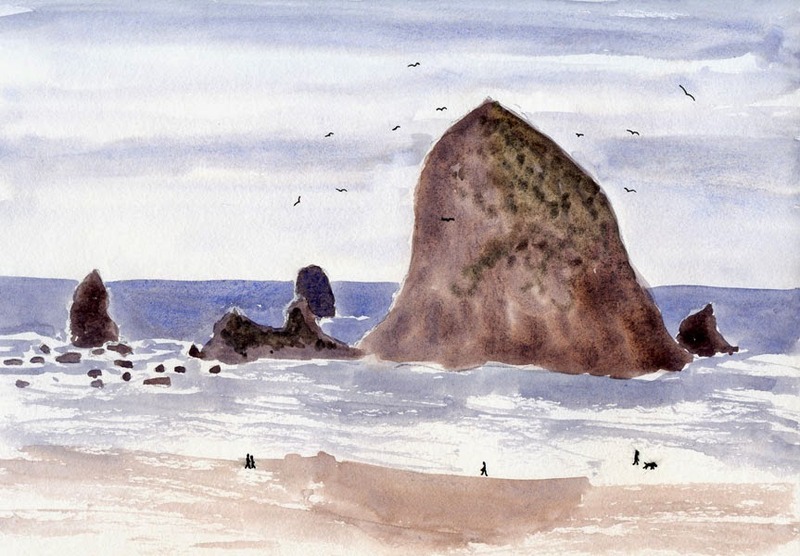 On the covers are the ship I sketched outside the Museum of History and Industry on Opening Day of boating season and one of many sketches of Haystack Rock I did last week in Cannon Beach. Ever since I decided to stick with 140-pound papers consistently in my handbound sketchbooks, I’ve been using the same format: three 9-by-12-inch folded sheets (12 sketching surfaces, using both sides) per signature, six signatures bound together into one volume, yielding a 72-page book. But more often than not, I opt to sketch across the gutter, and that signature format gives me only five double-page spreads per signature (the first and last page of each signature is a single page). Wanting more double-page spreads per signature, I tried binding four folded sheets per signature instead of three this time. Since the paper is heavy, the fore edge (opposite the binding) is a bit messier than with three sheets (a book artist would probably trim the fore edge clean), but I decided I can live with that look, particularly since it fits with the less-than-perfect look of my hand-stitched binding (but note the red-orange thread that matches the covers! It may not be perfect, but it’s colorful). To keep the book from being too thick, I bound together five signatures instead of six, yielding an 80-page volume. That gives me a few more pages per volume but one less signature, which means the binding goes a little faster – a tiny bit more bang for my bookbinding buck. Those long months of rain and gloom all winter and most of spring suddenly become worth wading through on a day like today: temperatures in the high 60s, sunshine and a clear blue sky! And just as suddenly, I realized I hadn’t sketched in Fremont since last August (well, except when the Friday sketchers met at the Fremont Coffee Company). It was time! 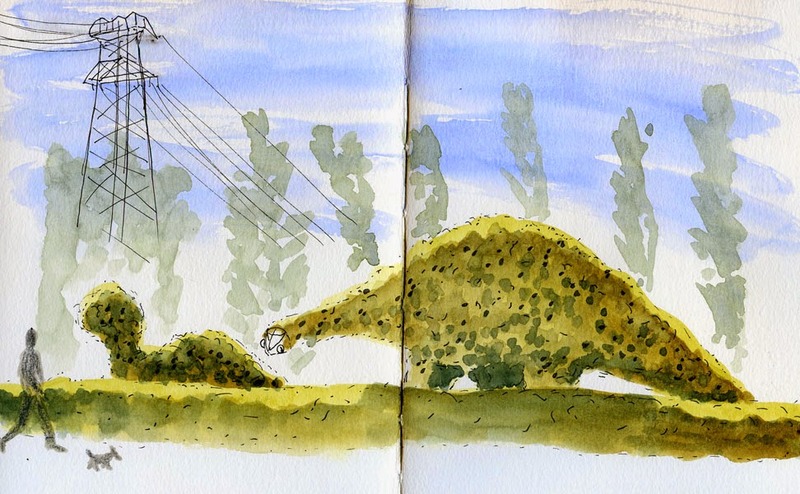 My first stop was the topiary dinosaurs, which I have been meaning to sketch ever since I saw the Seattle Sketcher’s sketch of them a couple of years ago. Rescued from destruction after a Pacific Science Center exhibit, the dinosaurs were put in Fremont, where the ivy covering them has been growing slowly since the late 1990s. 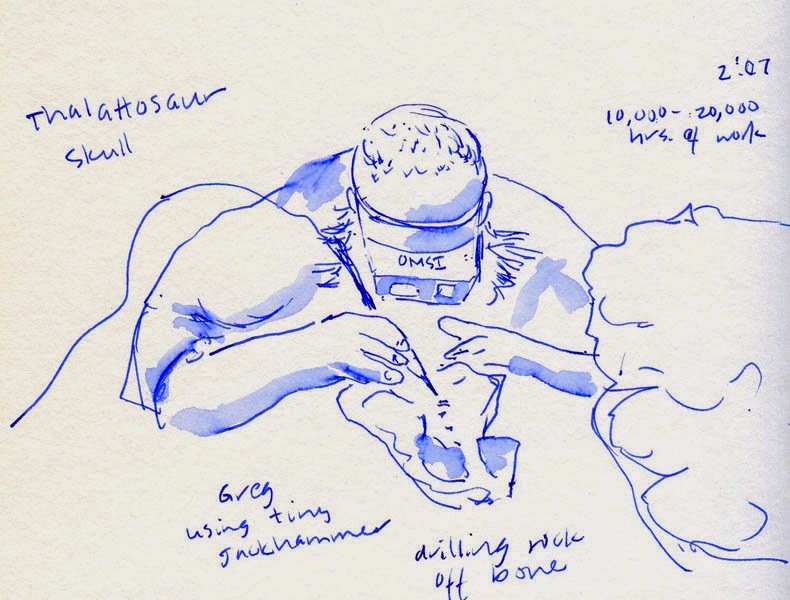 When Gabi sketched them in October 2012, a large part of the mama dinosaur’s head and neck framework was still exposed. Today I could see the exposed framework (and eyeballs) only near her face – she’s nearly covered at last. In fact, her baby looks like he could use a haircut – his head is looking a bit shaggy. After I finished the dinosaurs, I walked a short distance along the Lake Washington Ship Canal to the Fremont Bridge (which I had sketched last year). I actually walked back and forth a couple of times, trying to find a good view of both the bridge and the canal, but it’s hard to see past all the tall poplars growing along the shoreline. I settled for a partial view of the Aurora Bridge (blocked by the base of a power line tower similar to the one visible in the background of the dinosaur sketch). 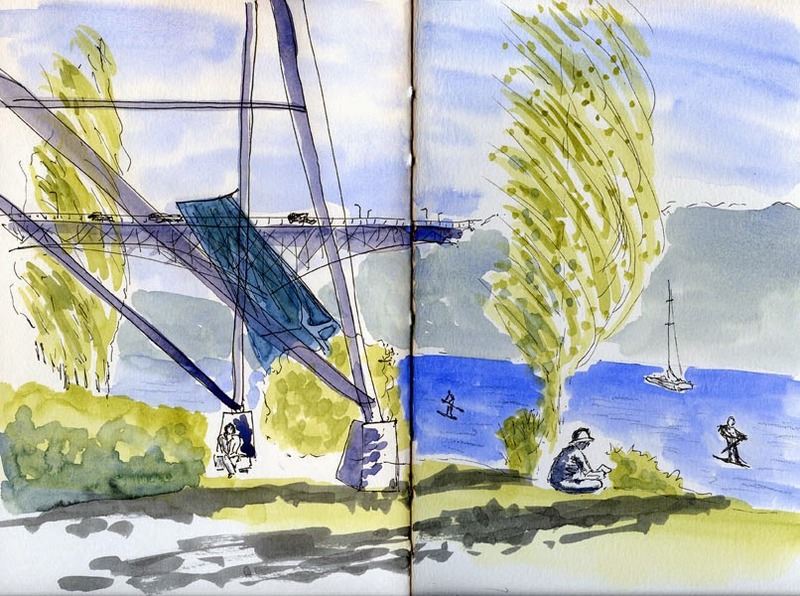 Just as I was sketching, the bright blue Fremont Bridge opened and came up – so half of it made it into my sketch after all. What is it with cranes? 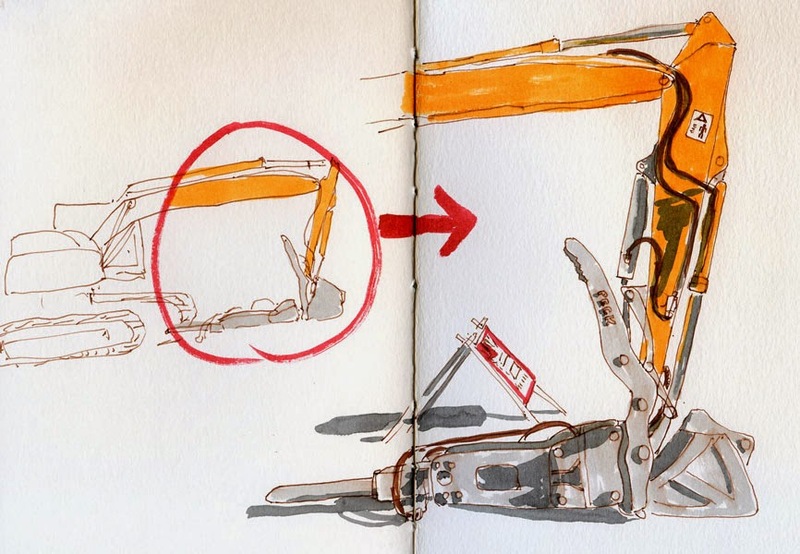 You might be wondering if I have a special affinity for construction cranes, given the number that I have been sketching lately. I don’t really have a particular fondness for them – they are just so ubiquitous that you can’t turn your head in any direction without seeing one. My sketchbook from last fall is back home. 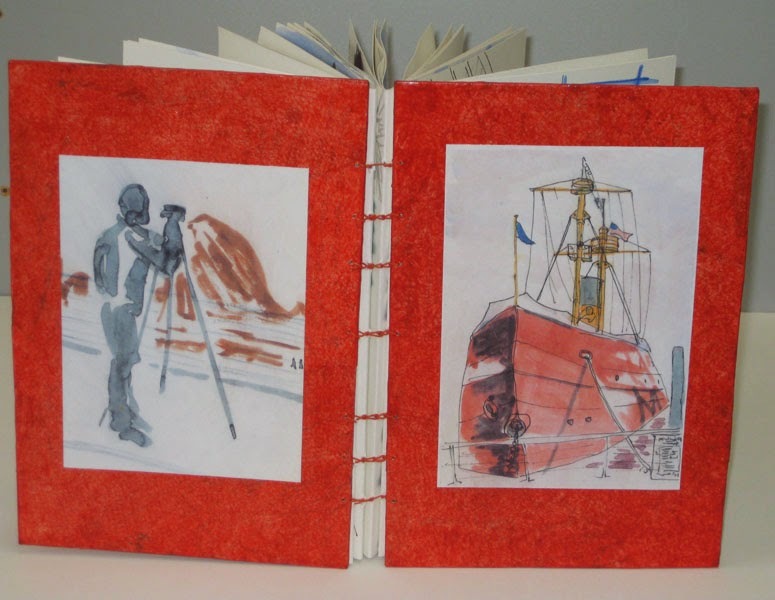 I made a brief stop at MOHAI this morning to pick up my sketchbook that had been on exhibit there since December as part of Gabi Campanario’s “Drawn to Seattle” exhibit. (I’m sorry that Gabi’s spectacular show is over, but I’m happy that my sketchbook is home again.) In the parking lot, I backed into a space so that I could get an ideal view of this construction crane. Much closer than I usually can be to a crane, I could see a lot more details – inexplicable as they are. For example, what could be the translucent, mesh-like, rectangular structure attached to the main vertical mast? 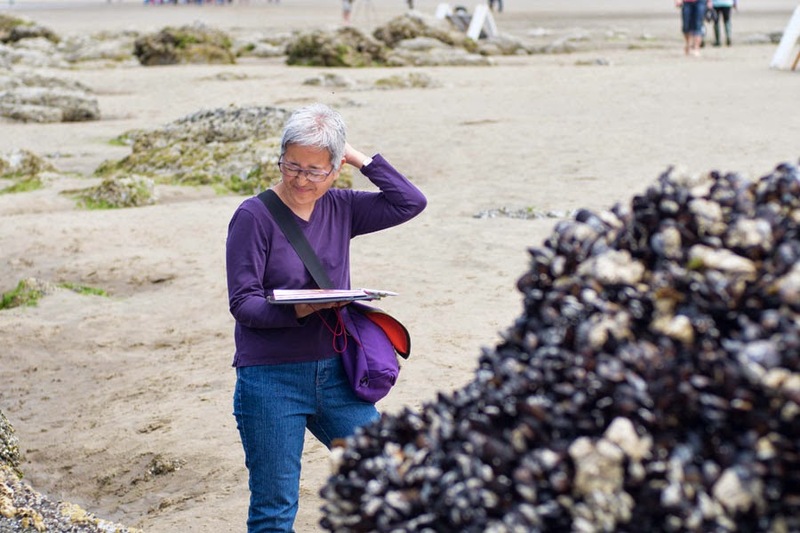 Seattle has a reasonably large sketching community; on warm summer days, we’ve had as many as 50 or 60 participants at Urban Sketchers gatherings. 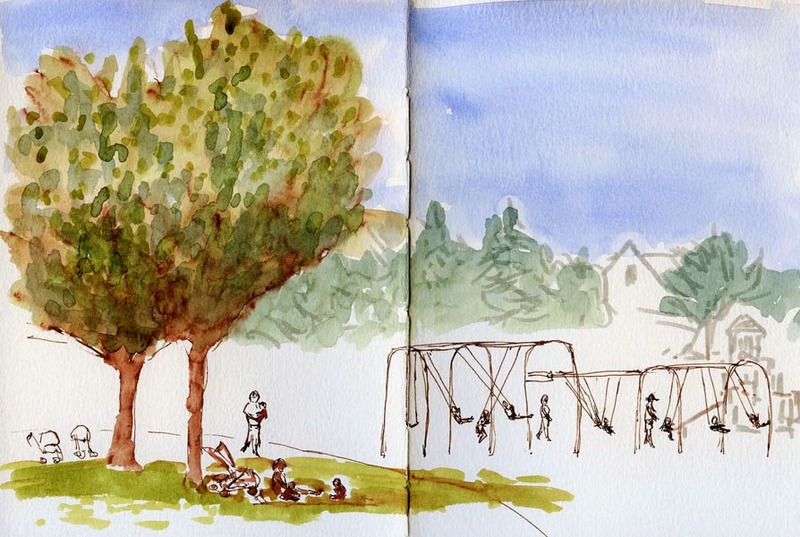 And yet whenever I’m out and about sketching in neighborhoods or parks, I never seem to spot other sketchers. 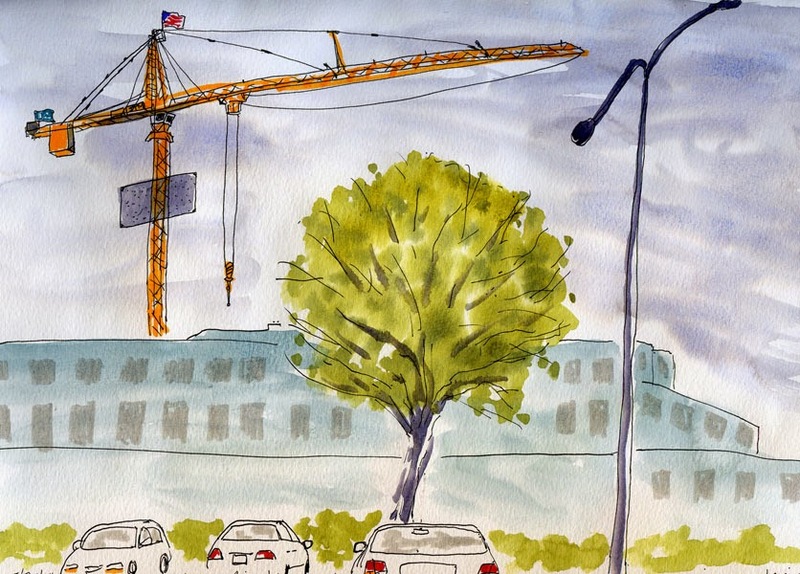 My plan today in the Roosevelt neighborhood was to make another progressive sketch of the Sound Transit Light Rail Station construction project, but when I got there, I realized it didn’t look much different from last time. 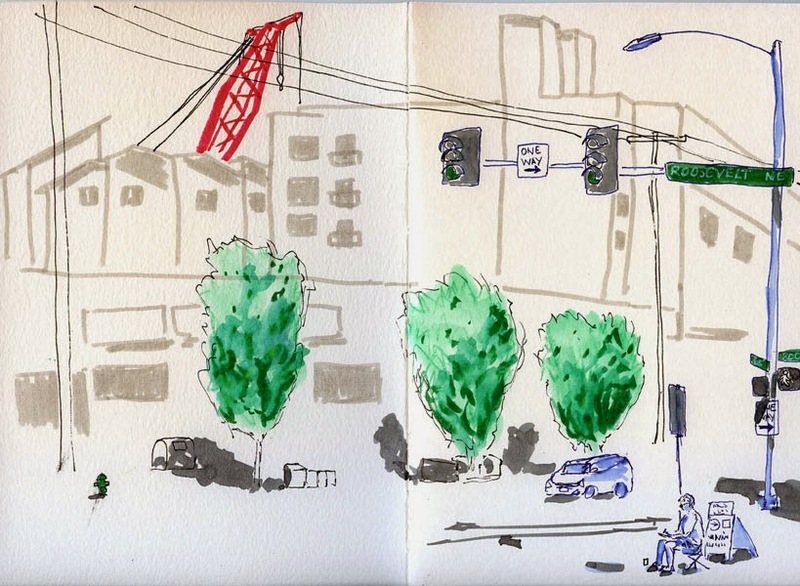 As I was driving through the intersection of 65th and Roosevelt, however, I glimpsed the familiar urban sketcher’s stance: a figure seated on a low stool, sketchbook on lap, gazing into the distance. 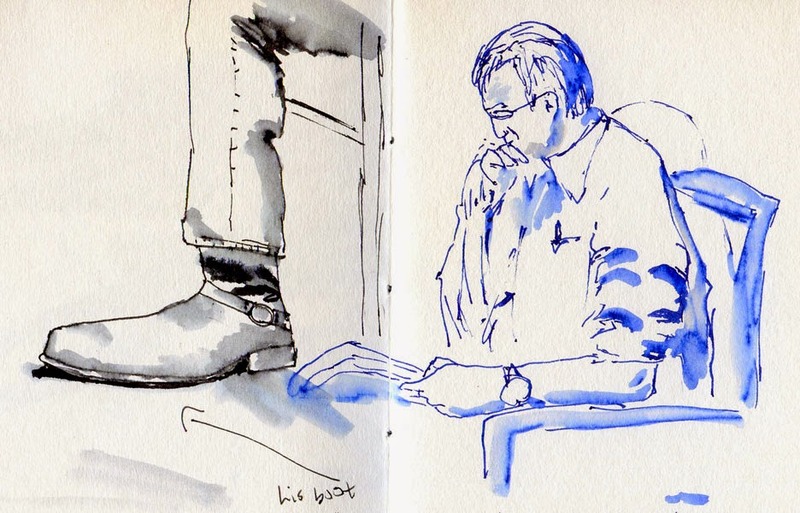 It was Steve Reddy, sketching the building across the street! I decided to skip the light rail project until more changes had taken place and instead sketch Steve sketching. But I did manage to get one of the construction project’s cranes in the background. Fuming, she stormed out. Apparently our doctor was running late. I had barely arrived in the waiting room, strategically seating myself so that I could get a good side-angle view of a man reading a magazine. 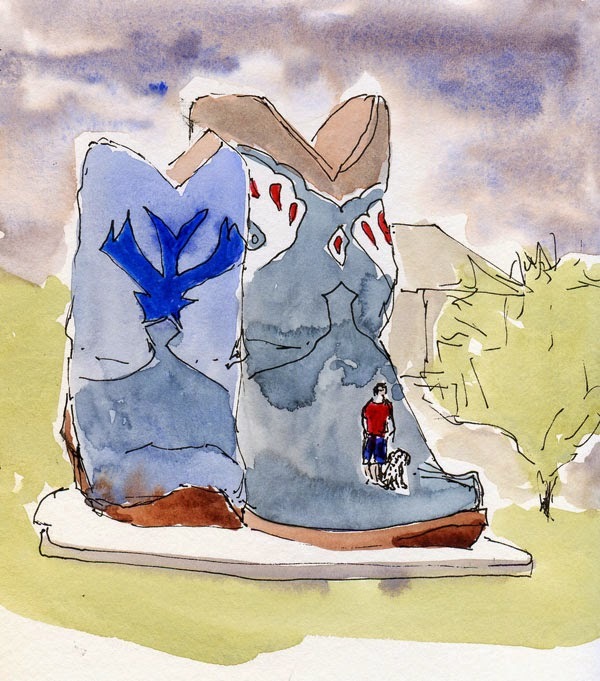 After sketching his top half, I glanced down at his feet and was surprised to see cowboy boots. Somehow I had expected a different type of footwear for a guy in a button-up shirt with a pen in the pocket. As it turned out, my wait was only about 15 minutes (maybe because the woman before me had left!) – exactly enough time for this sketch. Spoiled by the lovely weather we had in Portland and even here at home lately, I was disappointed by today’s rain (though not surprised; historically, it almost always rains here on Memorial Day weekend, so barbecues are generally theoretical). I don’t have big plans for the holiday, but of course I was hoping for some outdoor sketching. I went out to do a couple of errands, including returning a DVD to the library. Strangely, a Takeuchi excavator was sitting in the parking lot. Why, I have no idea – I’m just grateful that it gave me something to sketch (while intermittently turning on the windshield wipers) besides a still life at home. Yesterday on the way home from the cemetery, we stopped at Bellevue Arts Museum to catch several excellent exhibits – Folding Paper: The Infinite Possibilities of Origami; Fragile Fortress: The Art of Dan Webb; and Kathy Venter: LIFE. Although all three were fascinating, the latter was the most sketchable to me: life-size female figures made of ceramic. 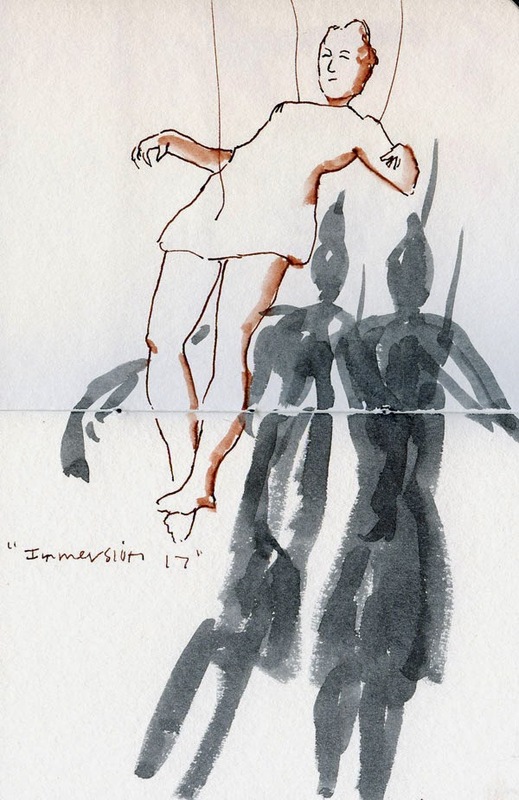 “Immersion 17” depicts a female figure suspended in the air while leaning backward. What made it especially interesting for this quick sketch was its twin shadows cast on the wall behind the piece. 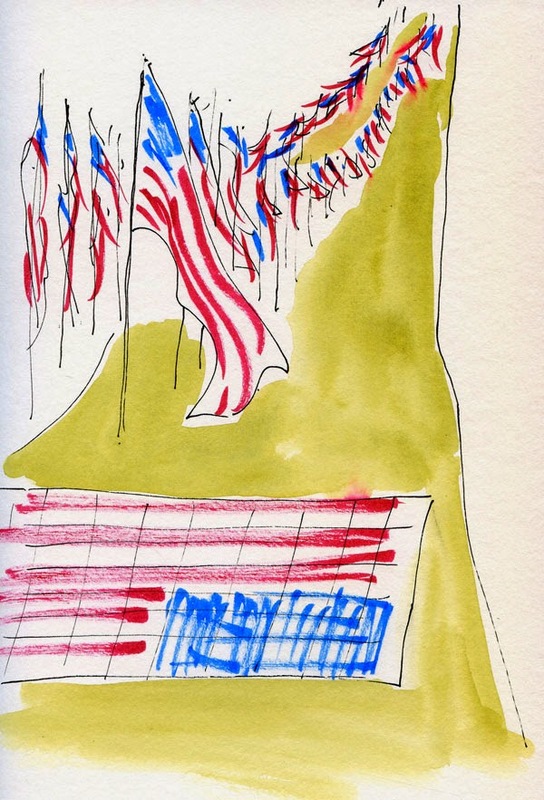 This sketch, made today at Sunset Hills Memorial Park, is in remembrance and honor of everyone we have lost. 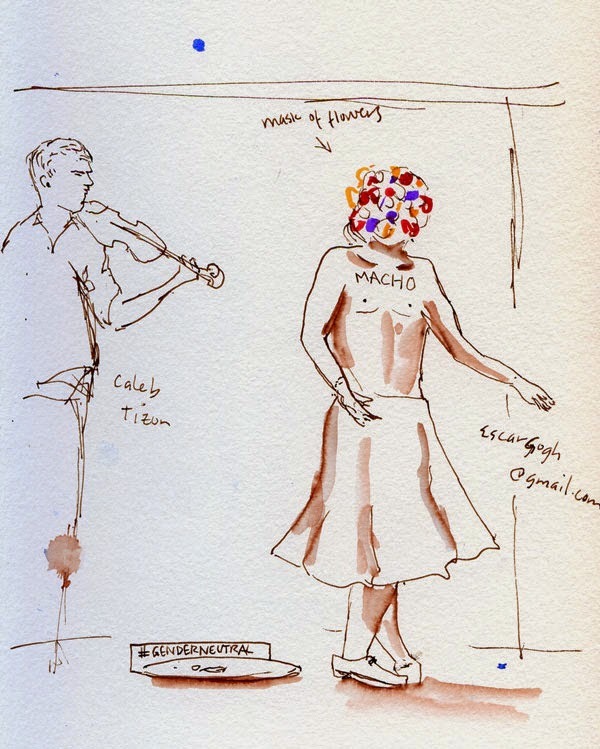 A year ago after our regular Friday morning sketch outing, Kate and I had made a side trip to sketch at the Northwest Folklife Festival in the afternoon. 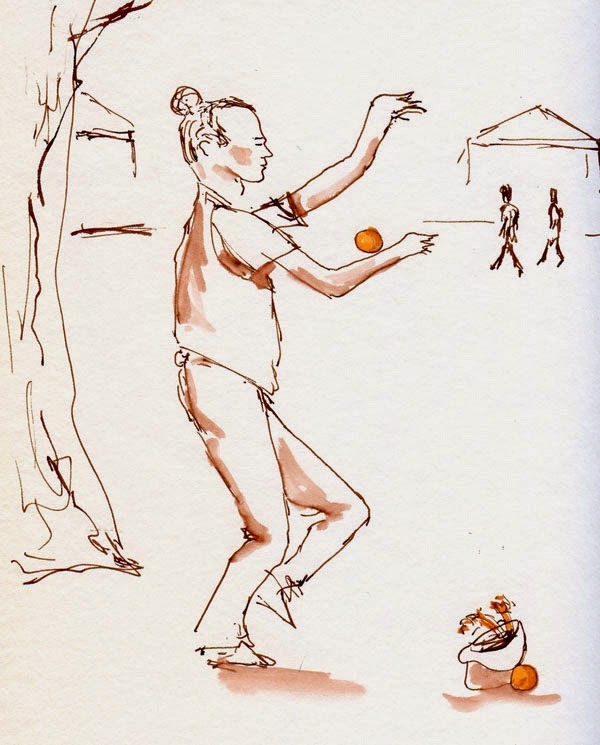 This year we decided to make the 43rd annual Folklife fest the main sketching event. 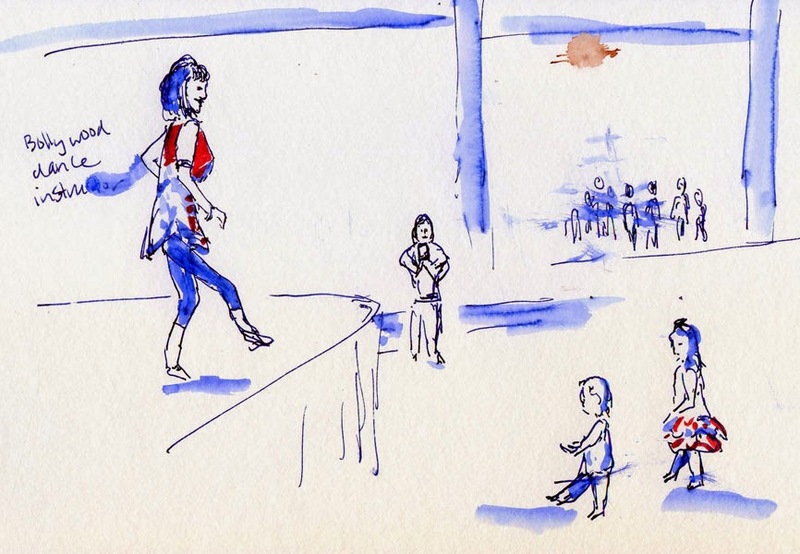 Although only a small group of sketchers showed up, it was fun to see the variety of views that caught our attention: Some focused on a particular musical stage performance; others sketched the color and festive ambiance. 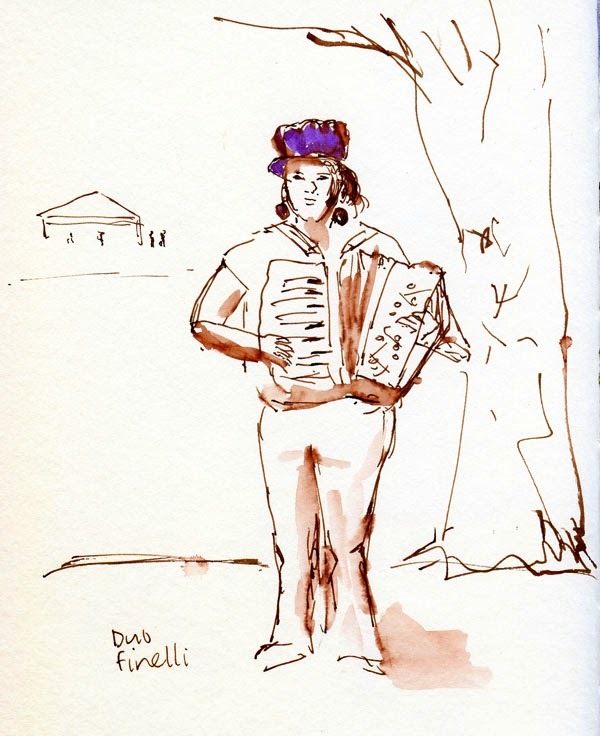 For me, the life of Folklife is defined by the buskers and other “informally” paid street performers who stand under any shade tree, sharing their particular art form. 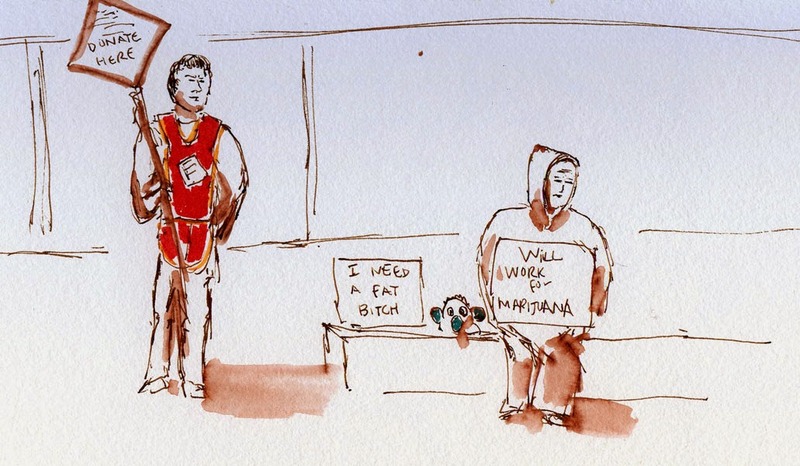 (Some individuals’ “art form” consists of expressing their opinions on placards.) 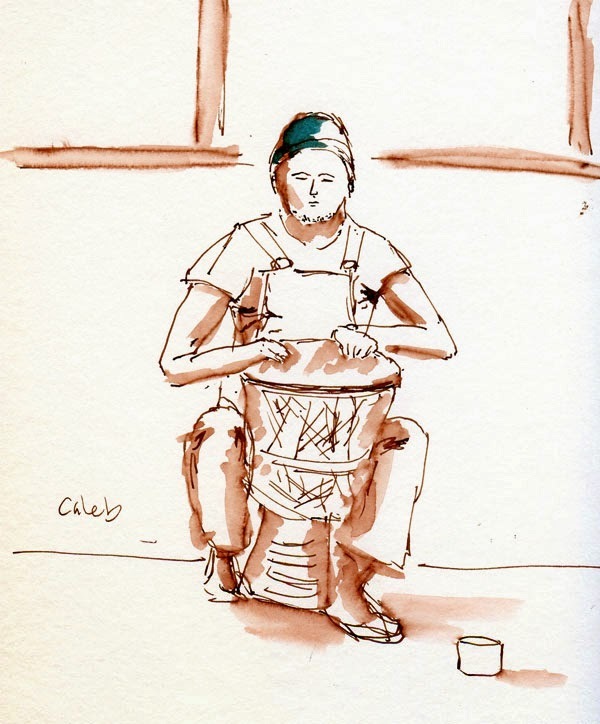 After I sketched a bongo drummer named Caleb who seemed to be having the time of his life, I dropped a dollar into his cup and showed him the sketch. Delighted, he also seemed surprised. 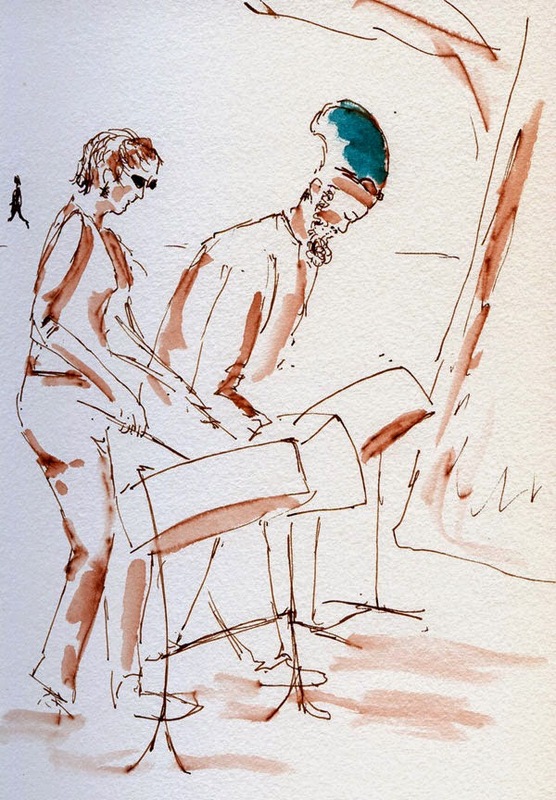 “You come to Folklife to sketch?” he asked, and when I replied by saying it’s my way of participating and interacting with all the music and activities, he suddenly got it. “Oh, just like me!” Indeed, just like him. 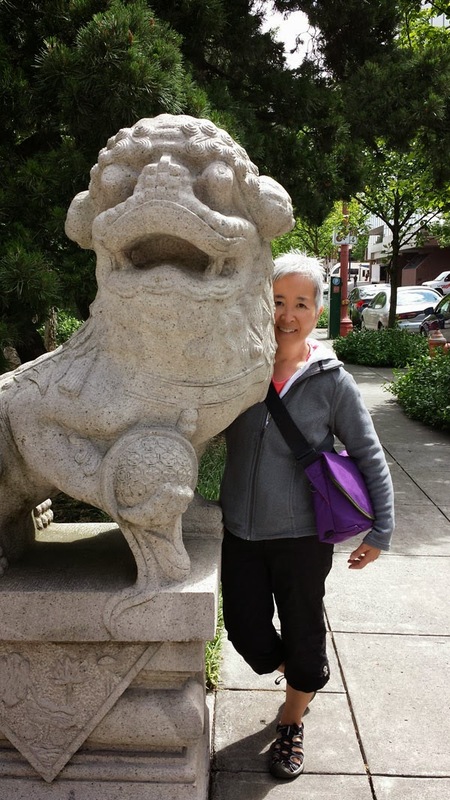 We spent our second day in Portland exploring two immaculate gardens: the Lan Su Chinese Garden in Chinatown and the Portland Japanese Garden in Washington Park. With a similar esthetic of quiet serenity, they are both different and beautiful in their own way. The Lan Su Garden is a tiny oasis in the middle of downtown, highlighted by ornate pavilions where you can stop to gaze at the large central pond. The ground is paved with intricately patterned stonework. 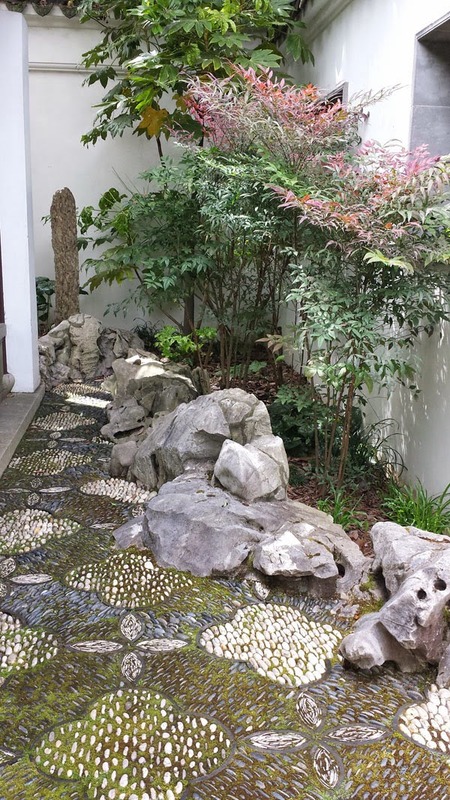 The Japanese Garden is more than 5 acres – a serene, multi-layered space filled with streams, koi ponds, Zen gardens, bumpy footpaths and bridges. There’s even a spectacular viewpoint of Mt. Hood, which was clearly visible that day. Between visiting the gardens, we stopped for lunch at Portland’s famed food trucks – a full square city block of every kind of food you can imagine. I opted for a grilled cheese sandwich; Greg chose Thai. 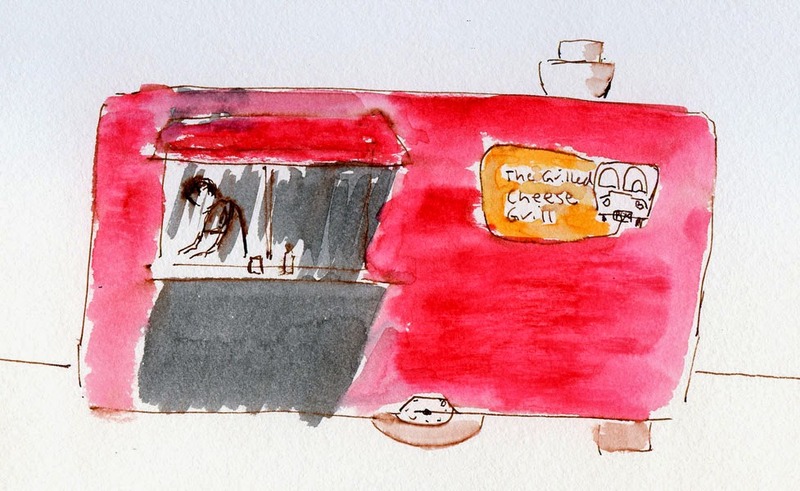 I started to sketch The Grilled Cheese Grill trailer while waiting for my sandwich, but the wait was only a few minutes, so my sketch was, too. We scarfed it all down seated on a bench outside the public library in the warm sunshine. Before I end my series of posts about our trip to Oregon, I have to include a plug for Waze, the free navigational smartphone app (no, I don’t work there – I’m just a very happy user!). Receiving real-time traffic updates from users, it not only navigates flawlessly – it also gives warnings of traffic snarls, disabled vehicles and even speed traps. 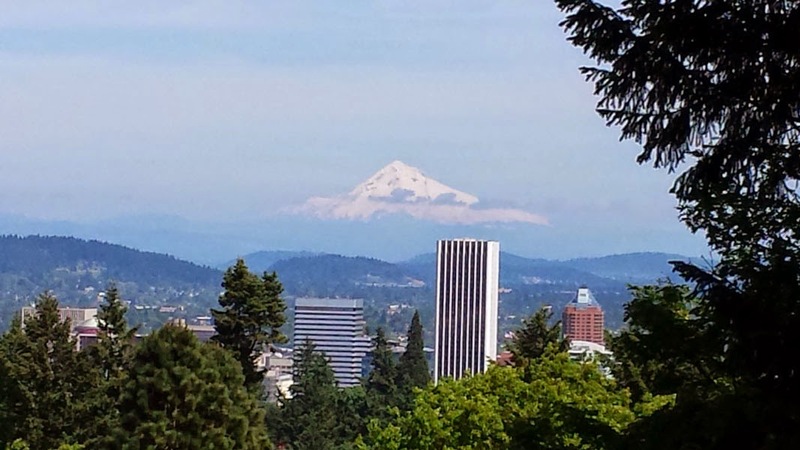 Although we’ve been to Portland a few times, we aren’t familiar with its maze of freeways and bridges, and Waze got us to where we were going every time, without fail, avoiding every traffic jam by offering alternate, less-congested routes. Greg and I both own traditional standalone GPS devices, but Waze is far more useful – it’s worth the price of my smartphone! Mt. Hood seen from Portland Japanese Garden. 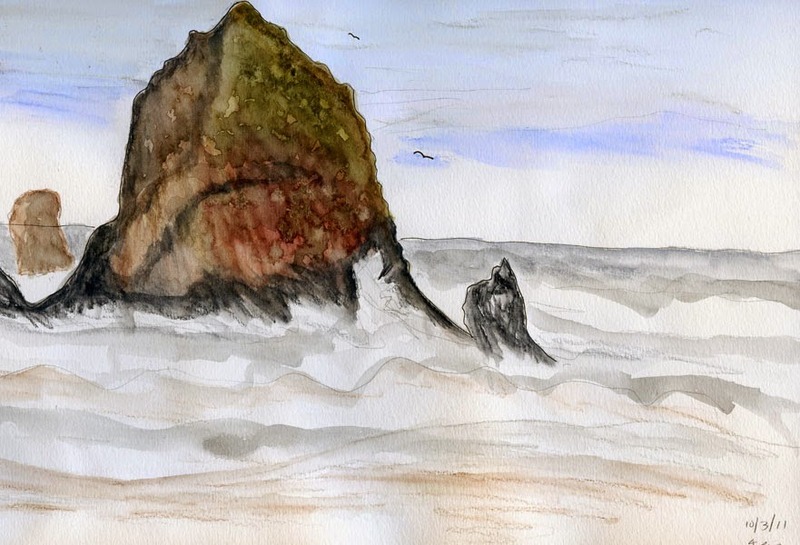 After a couple of heavenly days at Cannon Beach, we made the short drive to Portland to visit my brother and see a few sights. 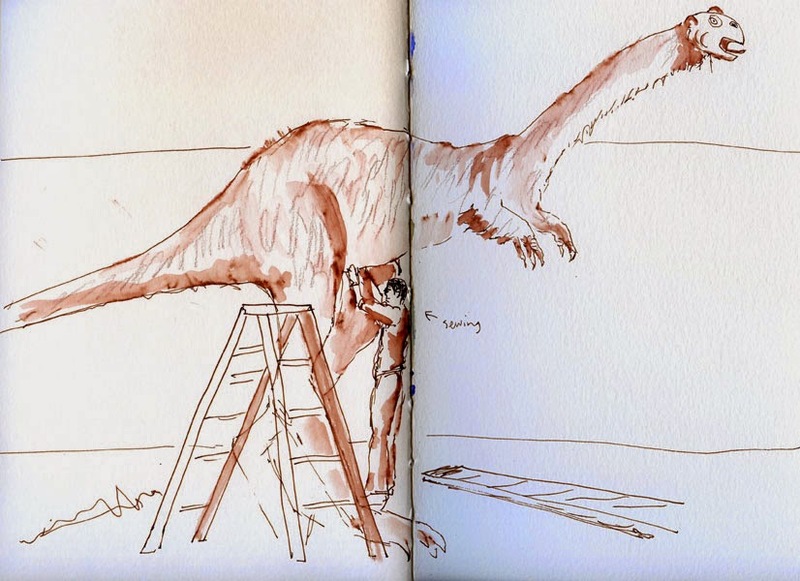 Our first stop was the Oregon Museum of Science and Industry, which was about to open a new dinosaur exhibit – unfortunately, a few days after we left. Workers were still setting up displays, including an animatronic dinosaur of some kind that was covered with fur (I thought all dinosaurs were scaly reptiles). It was amusing to see this guy sewing up the big guy’s leg. 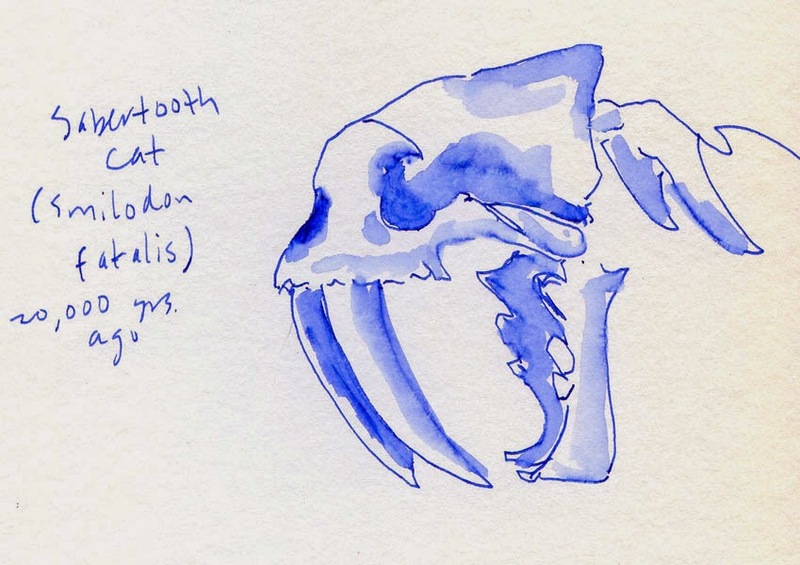 My favorite thing to sketch in any science museum is all the animal skeletons, and I found a sabertooth skull to sketch. In the paleontology lab, a volunteer was using what he called a tiny jackhammer to painstakingly remove stone from a Thalattosaur’s skull. He said it would probably require a total of 10,000 to 20,000 hours of work to finish all the pieces the museum had acquired of this animal’s skeletal remains. 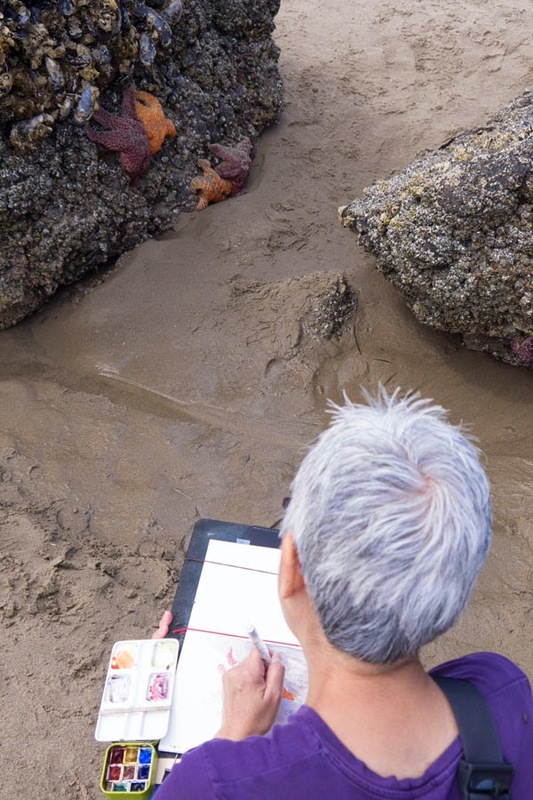 During low tides, I love exploring the tide pools at Cannon Beach, where all kinds of anemones, sea stars and other strange, wonderful and colorful critters cling to the rocks. 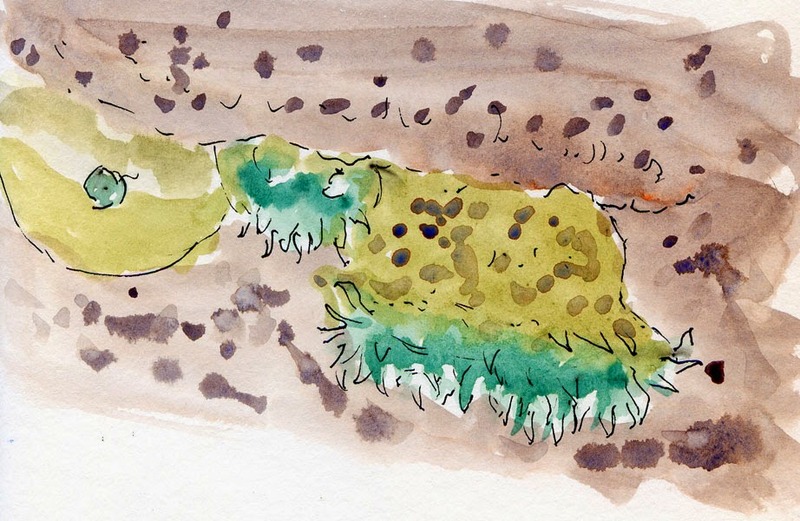 Unfortunately, huge swarms of sand flies were also hanging out by the tide pools, driving me crazy! Every time I stopped to do a sketch, these extremely annoying flies would light all over my face, neck, sketchbook, brush – everywhere! Needless to say, I only did a couple of quick sketches. 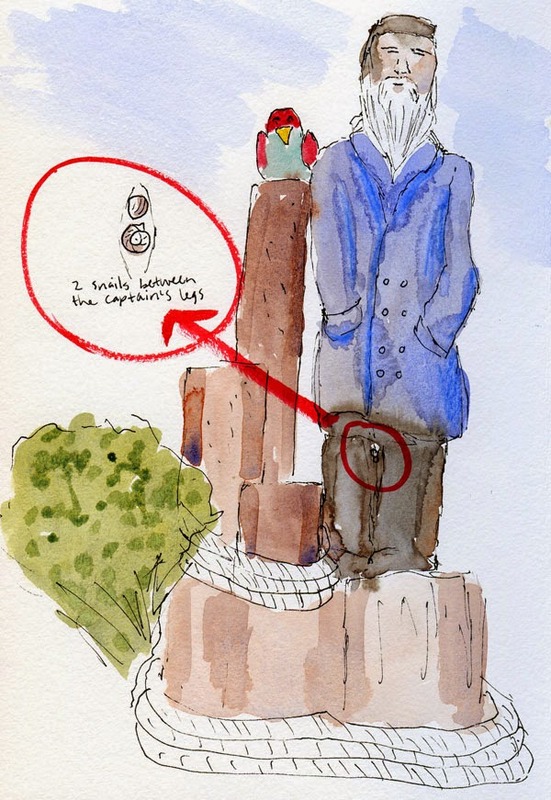 One of the most surprising critters I sketched on this trip wasn’t in the tide pools – it was on a whimsical sculpture of a sea captain that stands outside the Hallmark Inn where we stayed. 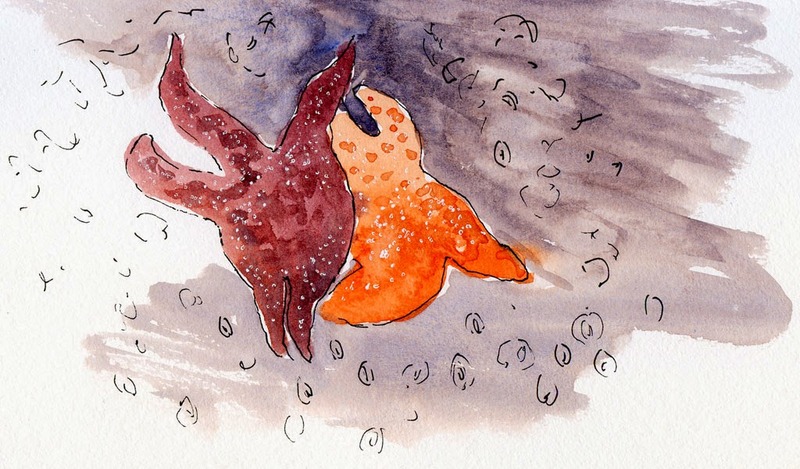 I spotted something between the captain’s legs – it turned out to be a pair of snails! 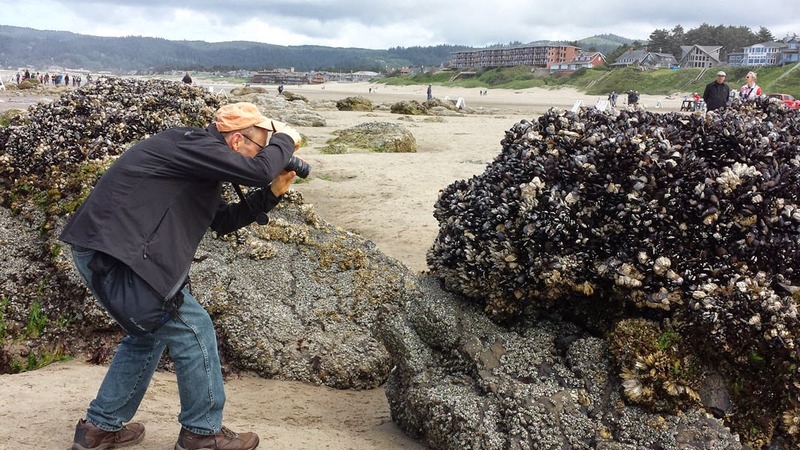 Greg and I have been going to Cannon Beach, Oregon, since before we were married. After honeymooning there in 1989, we tried to return every year, but sometimes other travels or the basic busy-ness of life got in the way, and we missed a year now and then. 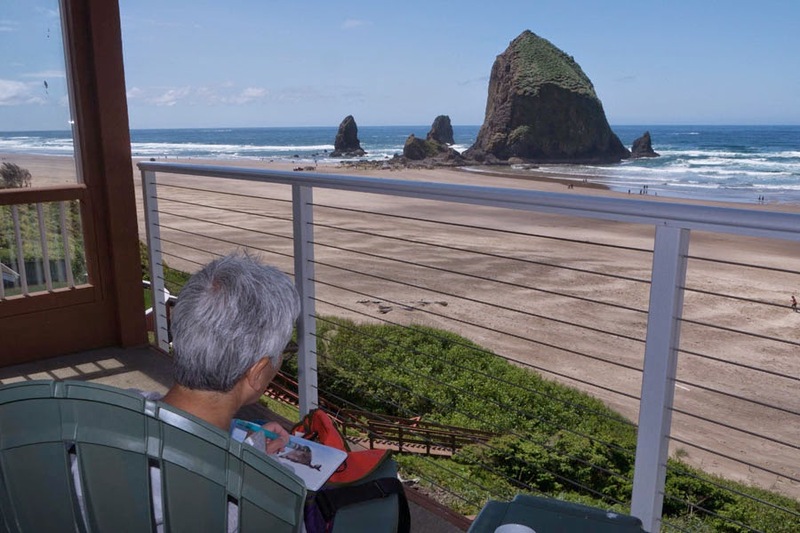 We’ve been traveling more than usual the past several years, and somehow we had missed going to our beloved Cannon Beach for far too long. 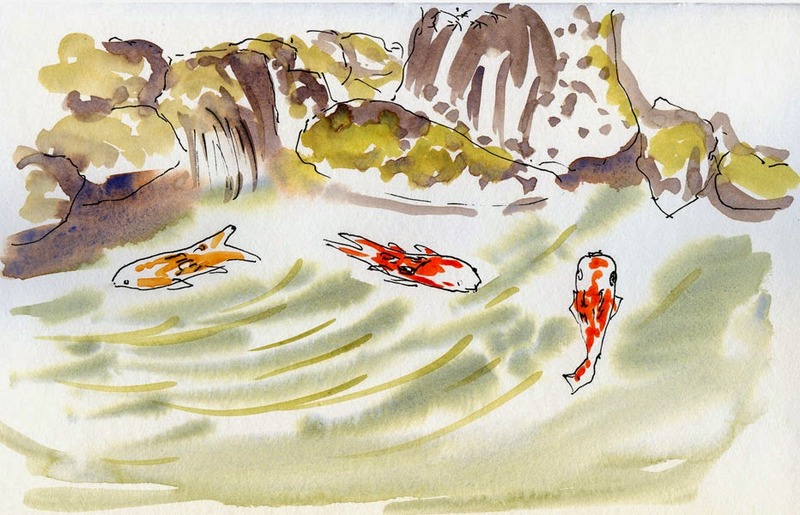 The last time we were there was in the fall of 2011 only a couple of weeks after I had begun sketching. 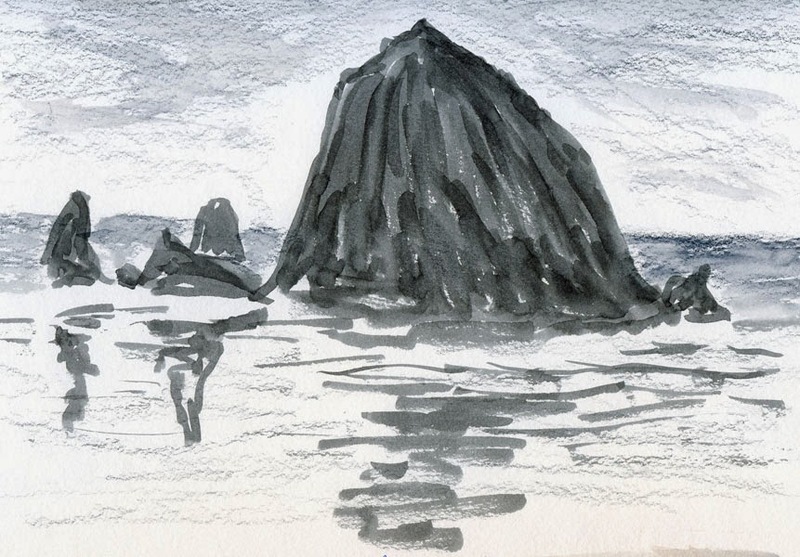 Despite being intimidated by the spectacular view and knowing my sketches could never live up to it, I did make a couple of attempts back then (see one at the very end of this post). Earlier this week we finally made it back to one of our favorite places on earth. 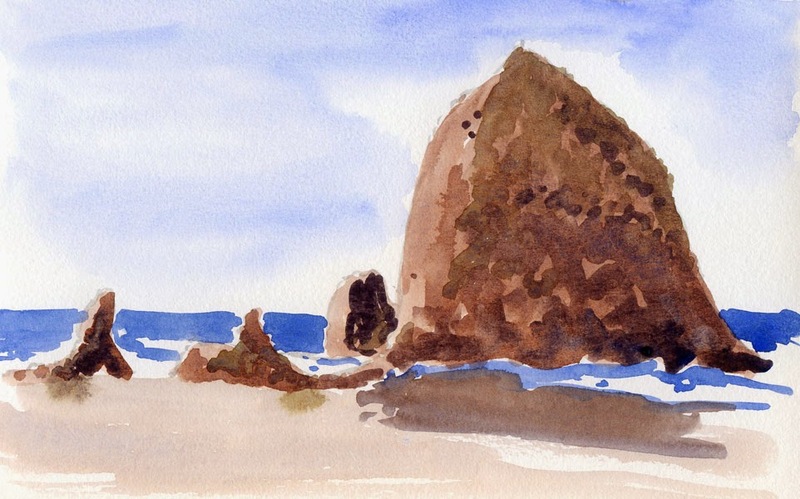 Trying to make up for lost time, I sketched Cannon Beach’s iconic Haystack Rock as many times as I could – at high tide and low tide; in the morning, at midday and at dusk; in rain, sunshine and clouds. 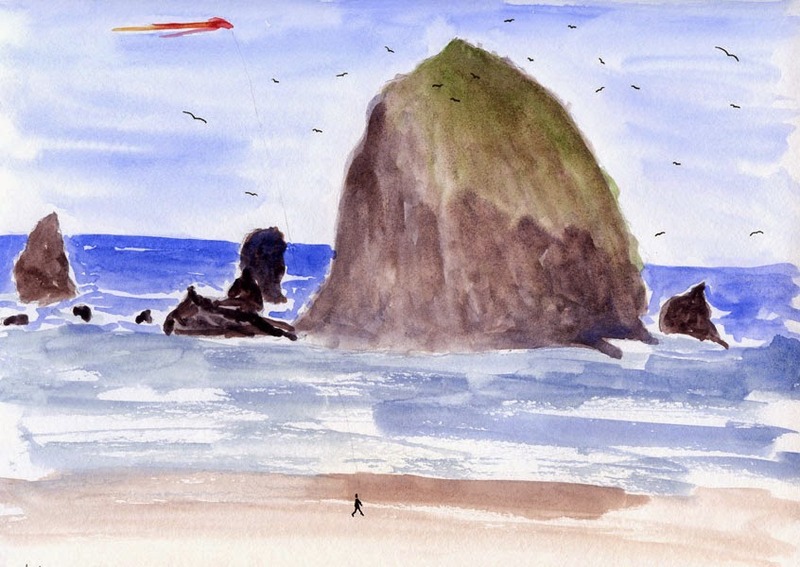 I never tire of this view – seeing it, sketching it, living it. 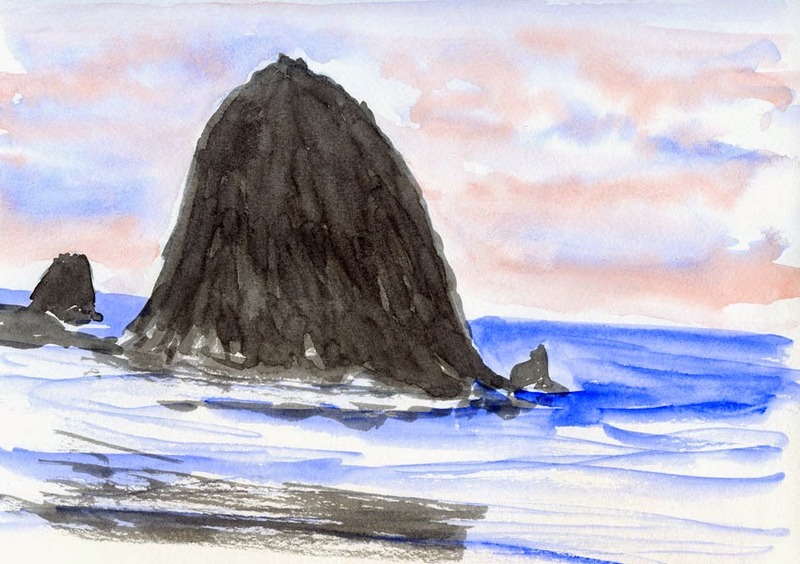 10/3/11 My first attempt at sketching Haystack nearly 3 years ago. I sketched most of the Haystack sketches from the comfort of our hotel room deck! Easy Street Records and Café, an independent music store in West Seattle, has a long and famous history related to Seattle’s rock and grunge community. Unfortunately, since I’m neither a rock nor grunge fan, I can’t tell you about it (see the Wikipedia article I’ve linked to if you’re interested). All I know is that it has a nice coffee shop with outdoor tables, where I sat this morning leisurely sipping a latte while I waited for Greg, who had an appointment in the neighborhood. There’s a lot going on in West Seattle’s Junction. Seated near the intersection of California Avenue Southwest and Southwest Alaska Street, I could see three construction cranes at work. Gas Works Park on Lake Union is a quintessential Seattle icon: A mix of old and new, industry and nature, commerce and recreation, and a bonus view of the Space Needle. 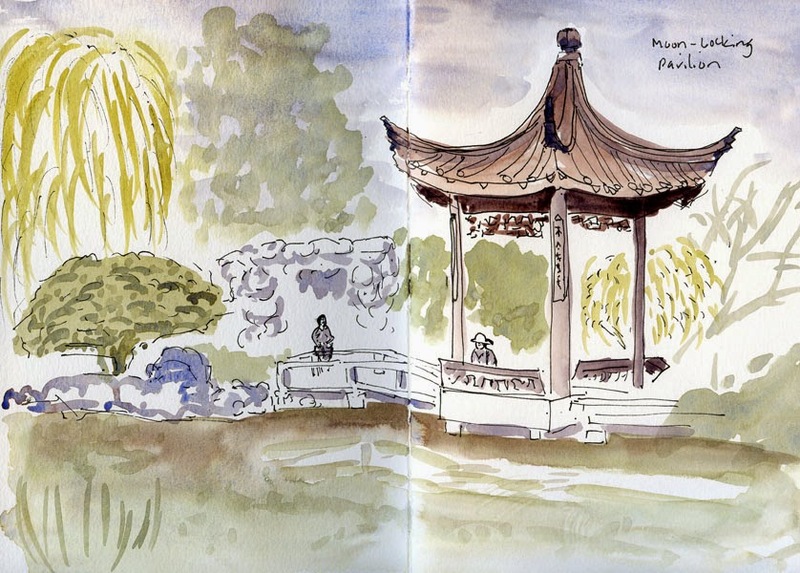 As such, I’ve sketched there numerous times – the first was almost exactly two years ago, then again a few months later, a year ago this month in Gail Wong and Frank Ching’s Urban Sketching workshop, and then again later that summer. But in every case, I managed to deftly avoid sketching the park’s namesake – the gas works themselves. Those huge, hulking remnants of the coal gasification industry are like a Rube Goldberg invention of pipes, smokestacks and ladders now embellished with colorful tags. To say the least, they are intimidating to sketch. Something about this beautiful day – the sky a bit hazier than in the past several days, but still 74 degrees with a soft breeze – shored up my courage. I climbed to the top of the kite-flying hill for the best view of the old gas works. When you’re used to many months of overcast skies, it’s a treat to have sufficient natural light for strong shadows, so I decided to feature the interesting shadow cast by a main pipe. Technical note: When it was time to refill my fountain pen a few days ago, on a whim I filled it with waterproof Platinum Sepia ink instead of my usual Platinum Carbon Black. I bought the bottle of Sepia a couple of years ago and tried it briefly, but it doesn’t dry as quickly as Carbon Black does, so I kept smearing it and decided I preferred Carbon Black. But every now and then I get into a brown mood (Diamine Chocolate Brown water-soluble ink is an all-time favorite), so I gave Sepia another try. 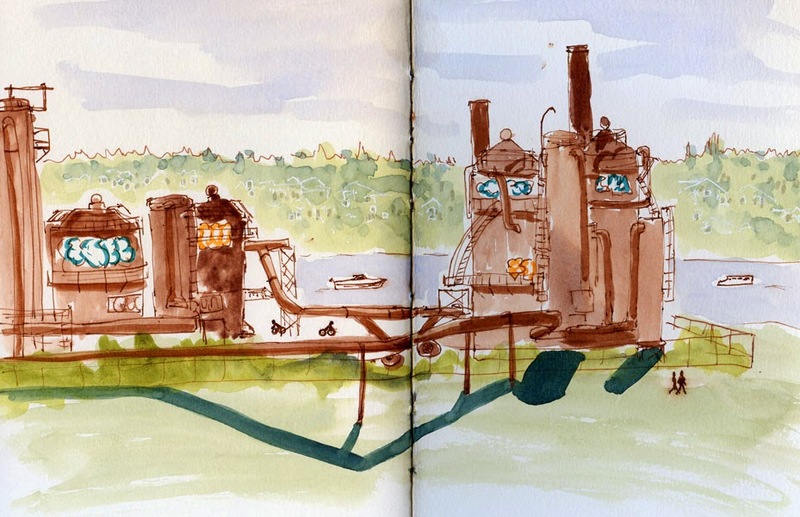 It turned out to be perfect for today’s sketch of those warm reddish-brown gas works. 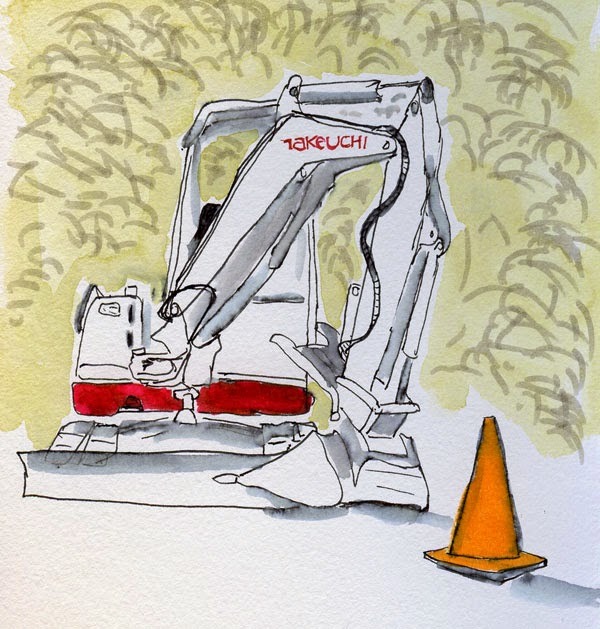 Just about a month ago, a Komatsu crawler excavator showed up on our block, along with the “no parking” signboards, and we all had plugged our collective ears in anticipation. The excavator did make a large hole in the street, but mostly it spent a couple of weeks doing nothing but take up space. Then it went away, leaving only a plate-covered hole in the ground and questions. It’s baaaaack – and this time it has a jackhammer on it. Now the fun – and noise – really begin! (Four-year-old boys intuitively understand this. As I was sketching, the boy whose house the Komatsu is parked in front of came out with his mom. At the sight of the returned crawler, he cheered and jumped up and down!) Rather than sketch the whole Komatsu again, I decided to focus on the soon-to-be noisy business end of it. To show the part I detailed, I took a cue from Mike Daikubara, who often draws the whole object and then pulls out certain elements to enlarge and focus on. I have to go look for my earplugs now. Only one thing makes an annoying errand tolerable: squeezing in a sketch opportunity along the way. 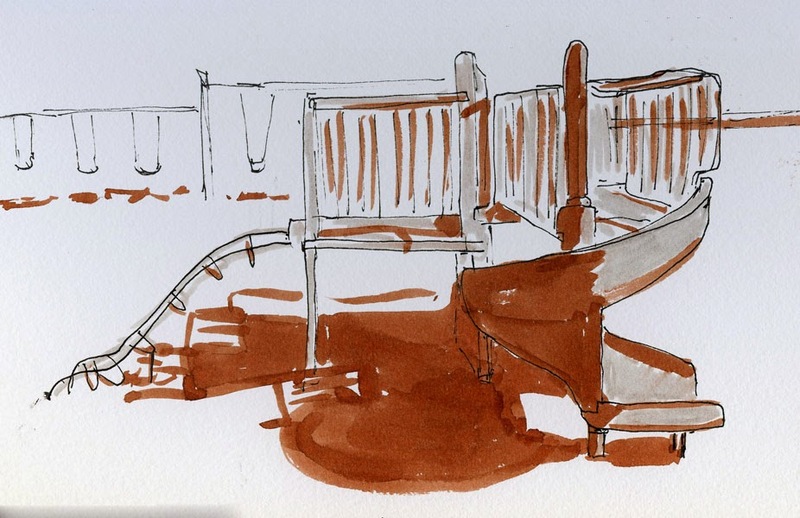 Before going to Northgate Mall for the annoying part, I stopped at the Northgate Community Center, which I thought would give me another chance to sketch a lively playground for this week’s Urban Sketchers Flickr group theme. It was about the same time of day as yesterday – early afternoon – and today was even warmer, so I expected it to be mobbed with kids. To my surprise, it was completely vacant – not a single soul of any age was on the playground (except me, of course). Despite the beautiful, sunny day, it felt strange, even slightly eerie, to see all the swings hanging completely still on this breezeless day, the merry-go-round and jungle gym empty. I decided to do an odd take on a sketch to match the mood: I focused mainly on the shadows cast by the twisty slide. 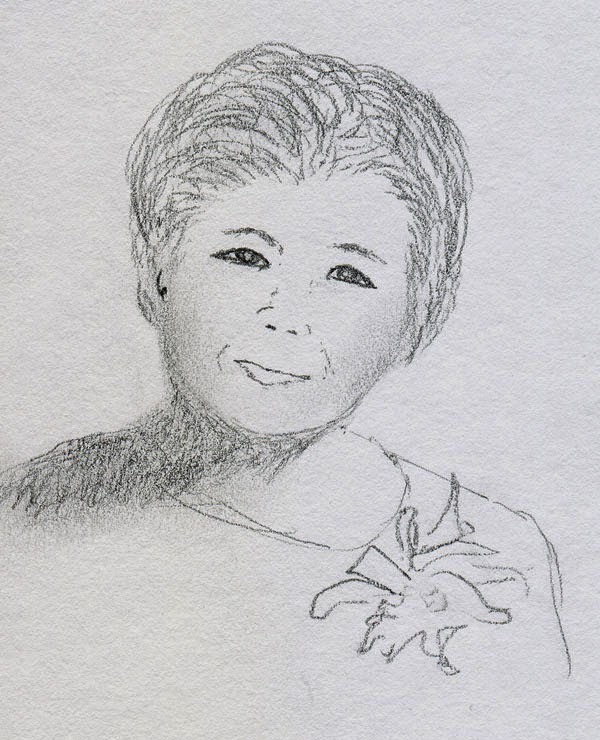 I always think of my mother as having been a generally happy – even exuberant – woman who found joy easily in life and shared that joy easily with others. Yet in photos, she often appears slightly wistful or sad with sort of a Mona Lisa smile. Happy Mother’s Day, mom. I still miss you every day. 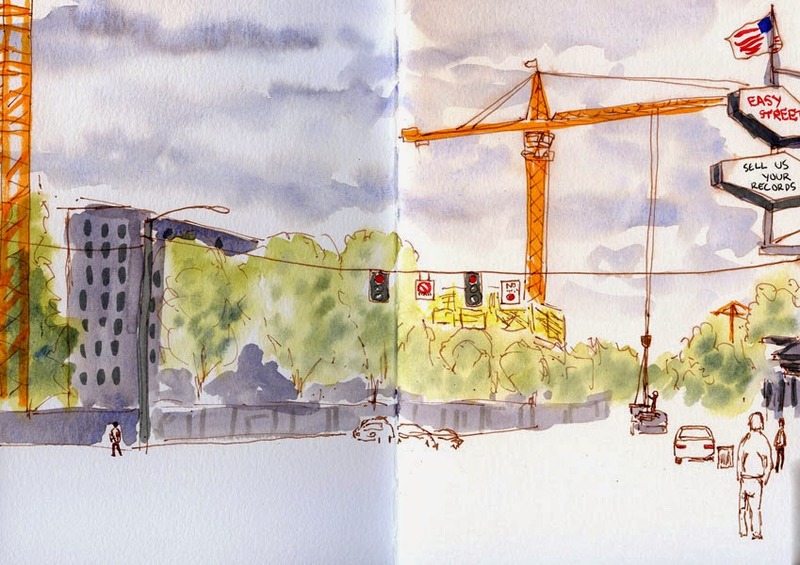 When I had heard that the Seattle Urban Sketchers’ May outing was going to be in Georgetown, I was disappointed because I knew I would be missing it that day, and Georgetown is so much fun to sketch. Nearly two years ago, only a few months after I had started sketching with the group, we met in Georgetown, and I spent the whole time sketching at the funky Trailer Park Mall. Georgetown is full of such oddities. We don’t usually find ourselves in the historic south Seattle neighborhood, but serendipitously, we had an errand today that brought us there, so I decided to get a quick Georgetown sketching fix. The legendary Hat ‘n’ Boots once marked a popular gas station. (Even Elvis supposedly visited when he was in town for the ’62 World’s Fair.) 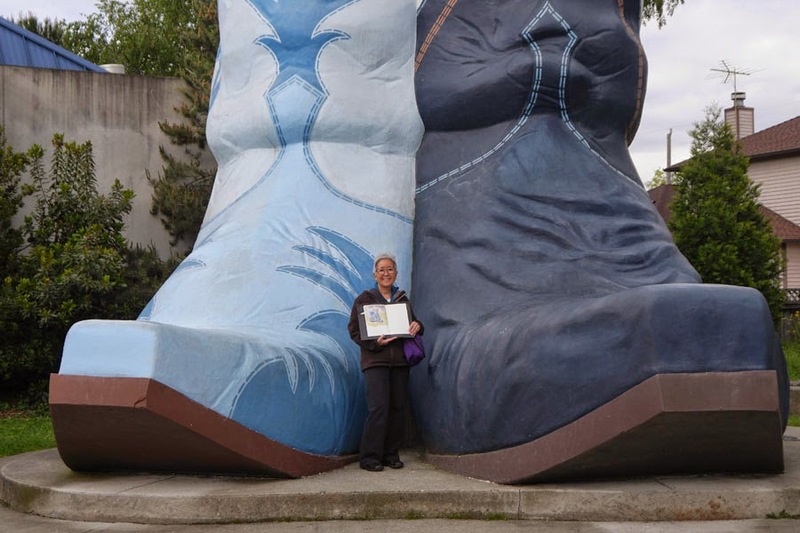 By the late ‘80s, the by-then shabby landmark was going to be torn down, but the Georgetown community rallied to save and renovate the old hat and boots. 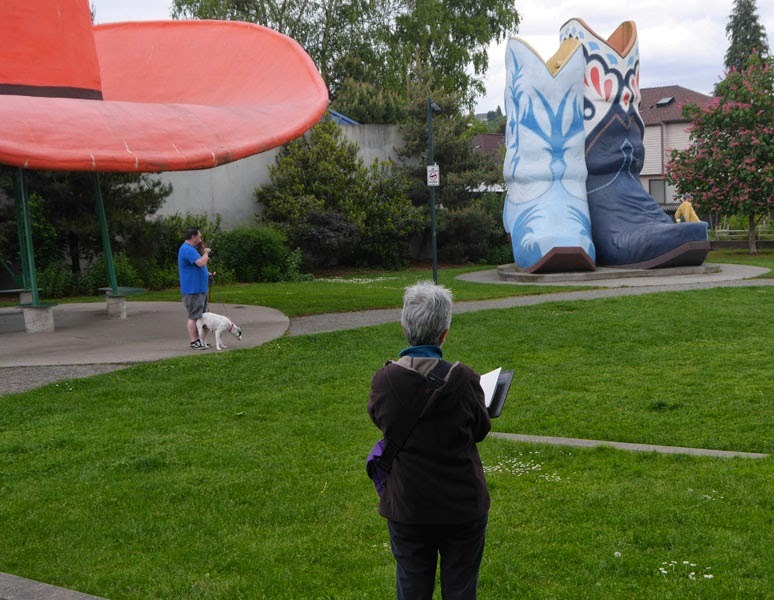 Along with a small playground, they are now the main attraction at Oxbow Park. The bright orange hat is so big that I would have had to stand across the street to get it into the same composition, and I knew it would take longer to make a sketch. The gray, ominous clouds looked like they might bust open with rain at any moment, so I settled for just the boots. Fortuitously, a man and his dog hopped up on a boot to pose for a photo just when I needed them to.